Two or three species of wide distribution in fresh water, the following typical. Zannichellia palustris L. Sp. PI. 969. 1753-Z. intermedia Torrey; Beck Bot. 385. 1833. 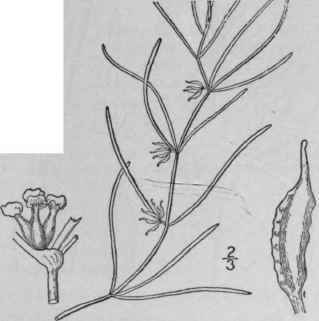 Stems capillary, sparsely branched, the rhizome creeping, the roots fibrous. Leaves 1' - 3' long, 1/4" or less wide, acute, thin, 1-nerved with a few delicate cross-veins; spathe-like envelope separate from the leaves and fruits at maturity; fruits 2-6 in a cluster, 1"-2" long, sometimes sessile, sometimes pedicelled, sometimes the whole cluster peduncled; style persistent, 1/2"-1" long; plant flowering and ripening its fruit under water. In fresh or brackish water, nearly throughout North America, except the extreme north. Widely distributed in the Old World. July-Sept.